This is a Dyed to Order Kit. Please allow up to 6 weeks for delivery. Kits are dyed-to-order. The Court Jester colorway is based on the colors of traditional Hungarian folk wear. This variation explodes with bright and cheerful colors and is sure to please those who prefer saturated colors and luminous fabrics. This kit includes 11 yards of Ricky Tims hand-dyed fabric in colors shown to make the quilt top (binding fabric included), the $59.95 pattern for free, plus free-video tutorials beginning May 1, 2018. You will automatically be added to the video tutorial list for email notifications. The Court Jester variation is created from Ricky Tims 100% cotton hand-dyed fabrics. The suede-like quality of these fabrics is always mesmerizing to anyone who gets up close and personal. The soft hand of these fabrics is remarkable. ADDITIONAL SUPPLIES: The quilt requires fusible web and stabilizer. 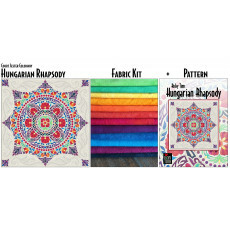 We are offering a Hungarian Rhapsody Notions Kit for $66.95 which includes 2 packages of Ricky Tims Stable Stuff Poly, 9 yards of Steam-A-Seam 2, and 4 oz. of Synthrapol for pre-washing. Click here to get the Notions Kit.